Here is a list of excellent resources teaching children more about agriculture and what goes on, “On the farm.” This list was originally curated in 2012 by Holly Spangler and was featured in the March 2012 issue of Farm Futures magazine. CGK will add books as they are available in the future. Because CommonGround Kansas is a Non-Profit organization, we have added affiliate links to these books. These funds are used for further education and outreach resources for those interested in learning more about Kansas Agriculture. There is no cost or price increase to you for using these links. The day-to-day business of harvesting crops to feed the world involves lots of lifting, hauling, cutting, chopping, plowing, planting, watering, mowing and more. Historically, this work was done by hand. Today, there are amazing pieces of machinery that help get each job done. The ninth book in our Kids’ Reading List series, Fantastic Farm Machines by Cris Peterson with photography by David R. Lundquist, introduces readers to 12 big pieces of farm machinery. From skid steers to sprayers, the author and photographer give an up close look at farmers and their implements hard at work. Children in kindergarten through third grade will enjoy the firsthand view of modern farm machinery and their functions. Young fans of heavy machinery won’t be able to put this book down. Young readers will find little Levi as curious and eager to prove his independence as they are while searching the ranch with him to find Little Red, Levi’s Lost Calf. A fifth generation ranch, author Amanda Radke, tells the story of Levi who, after the morning head count, realizes one calf, Little Red, is missing from the herd. Readers are introduced to a variety of barnyard animals as Levi searches the ranch for the calf. Radke uses her past and present, first-hand ranching experience to accurately tell this engaging story. Young readers will not only enjoy the tale, but also the beautiful illustrations by Michelle Weber. This little rhyme my mom used to tell me, and maybe you tell your kids too, was the first thing that came to mind when I began reading the tenth book in our Kid’s Reading List series, Pigs & Pork in the Story of Agriculture. Authors Susan Anderson and JuAnne Buggey talk about pigs and pork from the farm to the grocery store. This book for elementary and middle school students is filled with fun facts, photos and easy to read information. Did you know each person in the U.S. consumes around 50 pounds of pork per year? Find our more interesting facts with each turn of the page. Colorful charts, graphs and photographs help the reader understand pork’s role in the agricultural industry. From feed to food to fuel and more, soybeans are used for a variety of things that we come into contact with each day. In addition to its edibility, the super plant is used to make plastics, medicines, inks, fuels, soaps and many other products. The Super Soybean, by Raymond Bial, celebrates the humble soybean as a major U.S. export and renewable natural resources. Find out how big of an impact soybeans have on your family’s daily life through cultivation descriptions and references to the many uses of the plant. This is more than the average picture book for kids ages 8-11 years. They will enjoy this book filled with both colorful photos and informational text about soybean growth, harvest and consumption. My brother and I spent plenty of summer afternoons during out childhood making mud pies and dirt cakes. Just before presenting Mom with our creations, we would place the perfect dandelion in the center. 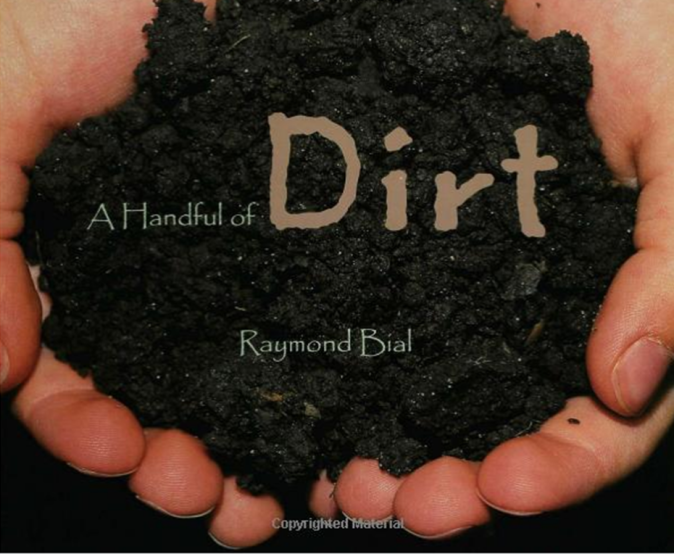 We thought of dirt as a toy, but author Raymond Bial tells a much different story in A Handful of Dirt. Full color photos compliment informative text as readers, Grades 3-5, are introduced to dirt dwellers of all shapes and sizes. The tiniest protozoans, myriad invertebrates as well as mammals and reptiles whose burrows aerate the earth will change the way the reader looks at one of Earth’s most precious resources. Even learn how to setup a home compost heap following the author’s instructions. Fairs are some of my favorite events during the summertime. Blue ribbons, funnel cakes, rodeos and show animals looking their very best. It takes hard work, perseverance and a love for animals from the whole family to get the cattle, pigs, goats and more ready for the show. The eighth book in our Kids’ Reading List series, Little Joe by Sandra Neil Wallace and illustrated by Mark Elliott, describes how Eli raises his bull calf, Little Joe, for the next year’s county fair. The heartwarming tale details the joys and discomforts of taking care of another living thing. Read along as Eli, and Little Joe, learn life lessons about growing up and taking on responsibilities. Readers in fourth grade and up will be immersed in the natural world of the farm. This book appeals to readers who can have similar experiences to Eli and many more who share a love for animals. The theme of family love is apparent through the story, making it identifiable for most readers. Each evening at our dinner table, my family sits down for a meal and conversation that inevitably involves picking playfully at one another. I rarely thought about how my family’s evening meal experience differed from other families around the world. 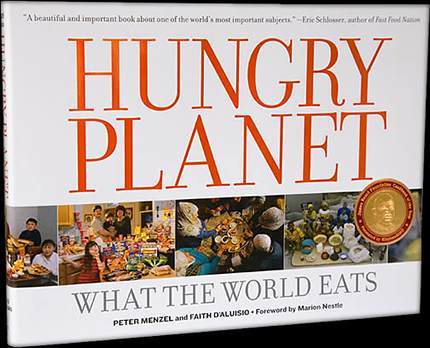 This changed when I read the seventh book in our Kids’ Reading List series, Hungry Planet by Peter Menzel and Faith D’Aluisio. The book profiles 600 meals of 30 families in 24 countries by detailing weekly food purchases. Each portrait includes the family surrounded by a week’s worth of groceries. Photo-essays also give readers a look at international street food, meat markets, fast food, and cookery. This book is best suited to give older children a glimpse into the forces that impact the dinner tables of families around the world. Readers begin to understand the influence poverty, conflict and affluence have on the nutrition of the family diet. pie or your neighbor’s banana bread that gets your mouth watering. There is one ultimate recipe that makes all these dishes possible. 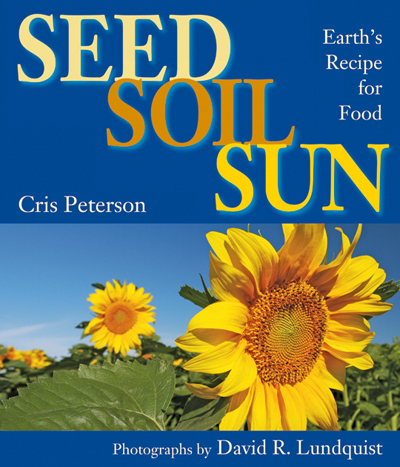 The sixth book in our Kids’ Reading List series is Seed, Soil, Sun: Earth’s Recipe for Food by Chris Peterson. This American Farm Bureau Foundation’s Agriculture Book of the Year celebrates the yearly planting, growth, and harvest of our plant food. The simple ingredients to Earth’s recipe, seeds, soil, and sun, all combine to create much of the food we each and some food for animals. Read on in the book to discover more about the wonder that is Earth’s recipe. Young readers, from four to seven years old, will enjoy the colorful photographs by photographer David R. Lundquist. They will learn from Peterson how seeds use soil and sun to grow into the fruits and vegetables they enjoy at the dinner table. Don’t get too attached, her father warns. But Libby Ryan can’t help herself. Our fourth book in our Kids’ Reading List series is The Beef Princess of Practical County by Michelle Houts. The novel tells the story of Libby, who chooses two calves to raise to show and sell at the Practical County Fair. Despite her father’s advice, she names her animals Piggy and Mule with hopes of winning the title of grand champion. She doesn’t realize how difficult it will be to auction them off once the fair is over. At the fair, Libby must face the pressure of competition and the reality that her calves will be sold and harvested for meat. Luckily, her family and friends are there to help. Readers in grades 4 and up will be touched by this tender story of growing up while learning about the care and respect that beef producers practice daily. Last week we introduced a new series of posts with fun ways to learn about food and farming with your kids. Each week, we’ll share another children’s book that connects the dots from farm to fork. 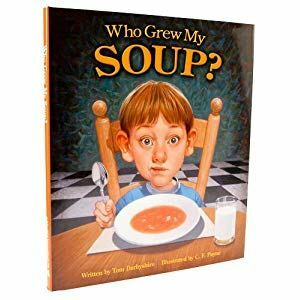 This week’s book is Who Grew My Soup? by Tom Darbyshire and illustrated by C.F. Payne. The picture book tells the tale of a young boy who refuses to eat his soup until his mother tells him who grew the vegetables in the concoction before him. A man in a flying tomato balloon swoops up the boy to visit the farms of the folks who grew the vegetables — carrots, beans, barley and more — that he’s about to eat. Looking for a fun way to learn about food and farming with your children? This is the first in our new series of posts sharing a list of children’s booksthat will get you thinking about how food gets from the field to your table. Oh, Say Can You Seed? by Bonnie Worth is a picture book that tracks the seed to plant. Here’s the scoop on the story from Amazon.com. Did you know George Washington was more than our nation’s first president and a general of the U.S. military? He was a farmer! The third book in our Kids’ Reading List series is Farmer George Plants a Nation by Peggy Thomas and illustrated by Layne Thomas. As George Washington was forging ahead to form a new nation, he was also creating a self-sufficient farm at Mount Vernon, Virginia. Did you know the president planted trees, bred mules and experimented with many crops including wheat? He mixed his own fertilizers and compost to help grow shrubs and vegetables. He designed a barn where his workers could thresh grain indoors. He even invented a plow that not only tilled the soil but also planted seeds! Ideal for kids in grades 3 through 5, the book includes excerpts of the president’s writings, a timeline, resource section and essays with beautiful oil-painted illustrations of Farmer George at work in Colonial America.